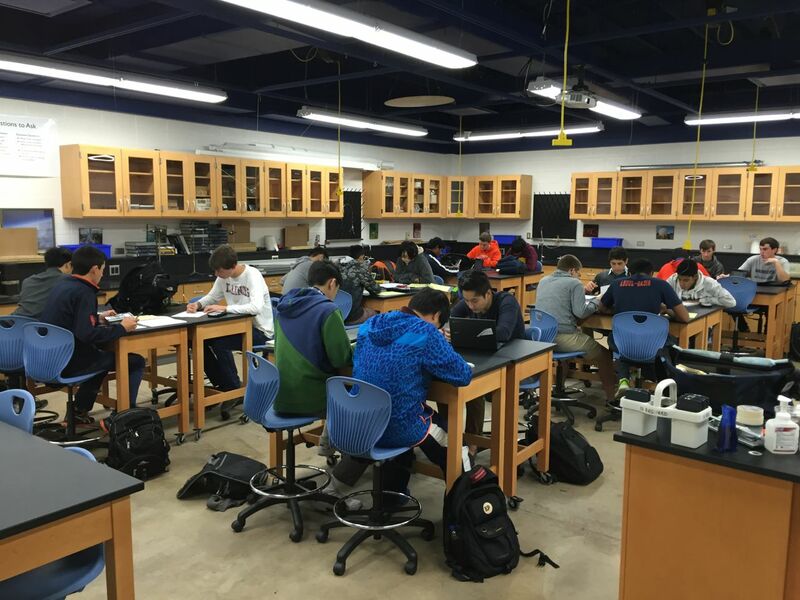 Today AP Physics 2 concluded the thermodynamics unit with an exam. I didn’t bother to take a photo. 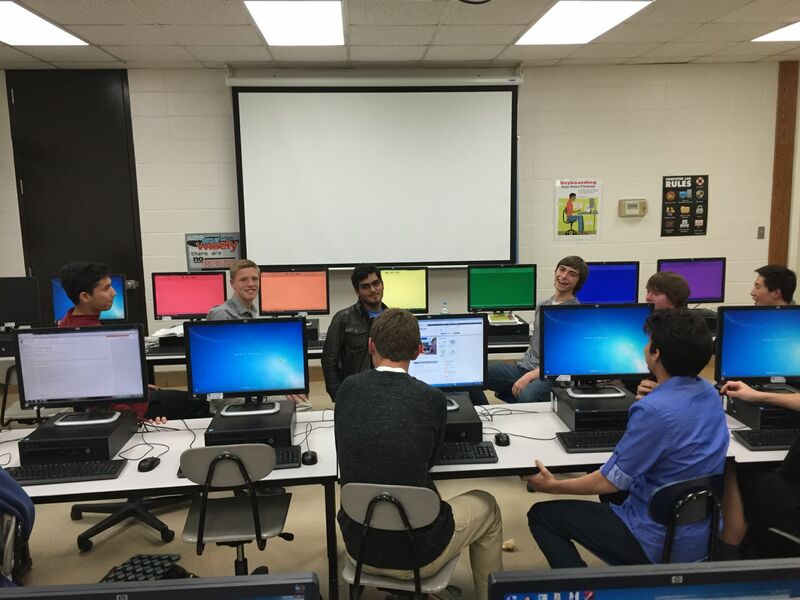 Instead, I’ll share a photo from my 8th hour AP Computer Science class. They were having trouble focusing minutes before the bell and also discovered there were buttons on the monitors with which they could play. 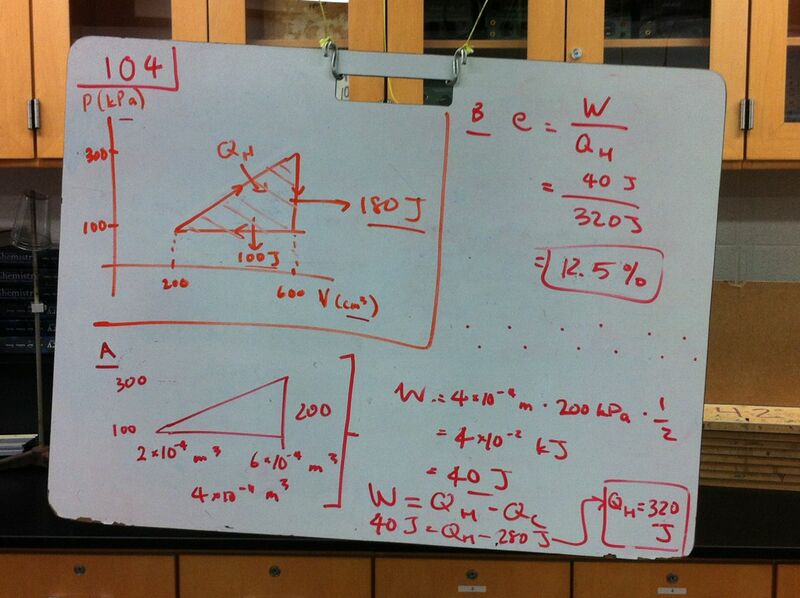 I felt that the AP Physics 2 student needed one more day practicing solving problems before the thermodynamics exam. 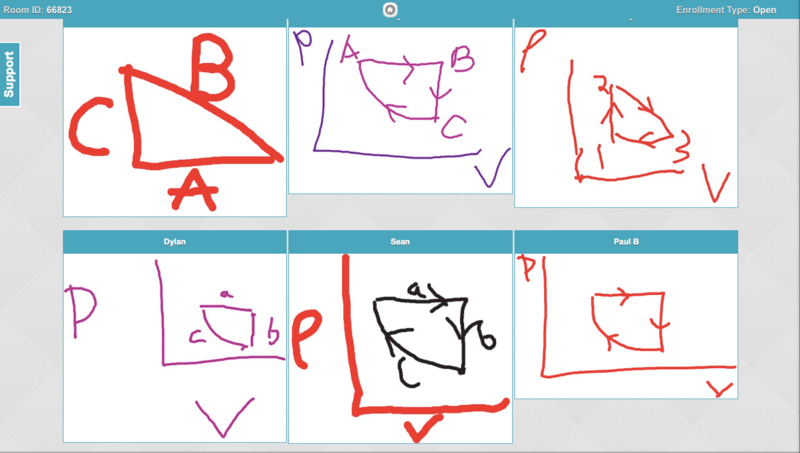 I supplied a couple of practice problems and students worked together in small groups to solve them. They were very engaged. At the end of class, students were definitive that the practice was very helpful. We’ll see how tomorrow’s exam goes…. Today in AP Physics 2, we spent the entire period discussing conceptual questions via peer review. The past couple of times I felt that we didn’t explore that many questions after we finished the quiz. So, today we had all of class and went back and discussed some of those questions we didn’t have time for previously. 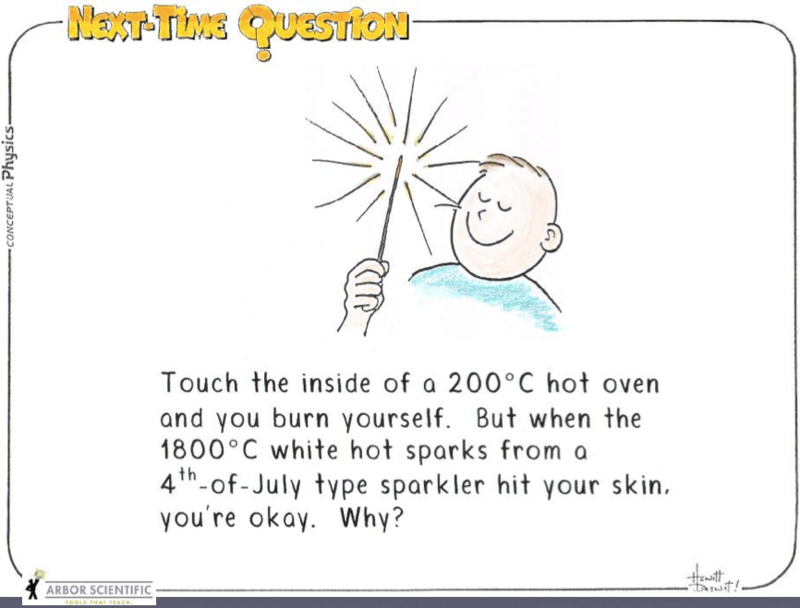 My favorite was this Next-Time Question by Hewitt that highlights the difference between temperature and thermal energy. I had students type their answer as a couple of sentences into InfuseLearning. It was helpful to share various answers as examples and highlight their strengths and weaknesses. Today, as AP Physics 2 starts our last week of thermodynamics, we tried a new activity that I learned at this summer’s AP Physics 2 Summer Institute. I’ve mentioned statistical mechanics a few times throughout our exploration of thermodynamics and wanted to provide students some insight into this area of physics and a different perspective on the concept of entropy. 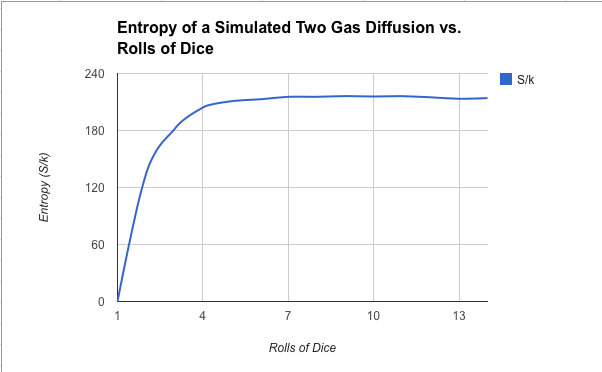 So, we modeled the diffusion of a two-gas system with dice. Each group started with 2 sets of dice of different colors. The initial state was all of one color on one side and all of the other color on the other side. They rolled the dice. A die is moved to the other side if it is a “1”. After each roll, they count the number of nice of each color on each side and record the data in a spreadsheet. The spreadsheet calculates the number of microstates for the particular macrostate and the entropy. After class, I aggregated all of the data from all of the groups. We’ll discuss the aggregated results tomorrow. Thinking of entropy as a way to quantify the probability of a state occurring is a powerful perspective. 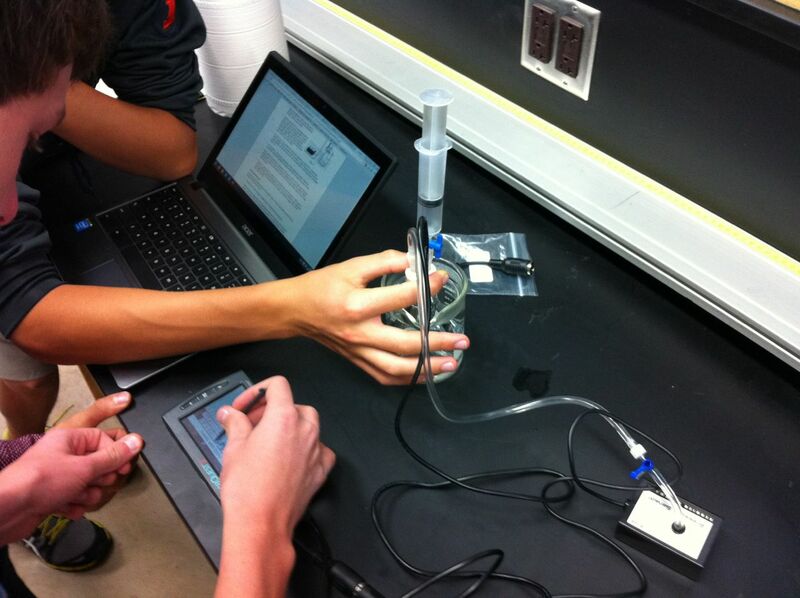 A lab I started doing last year was the Heat Engine lab from Advanced Physics with Vernier – Beyond Mechanics. 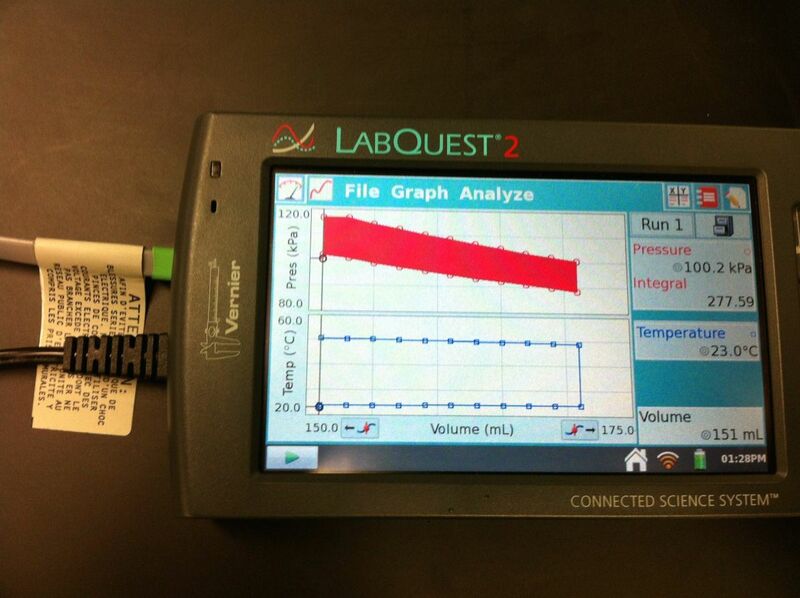 We did the lab again this year, but entirely on the LabQuest 2 instead of with LoggerPro. I’m consistently surprised with how much can be done entirely on the LabQuest 2 (specifically, integrating the area enclosed by the thermodynamic cycle in this case). The first part took longer than expected as students familiarized themselves with the equipment. We also had to troubleshoot some old equipment and make some replacements of hoses and stoppers that didn’t leak. Today’s whiteboarding presentations for AP Physics 2 focused primarily on heat engines. Sometimes a group just nails a whiteboard. This group so clearly presented the key concepts of a thermodynamic cycle; specifically, the graphical representation of the net work done by the cycle. I had to get up and take a photo. Today in AP Physics 2, I introduced heat engines. 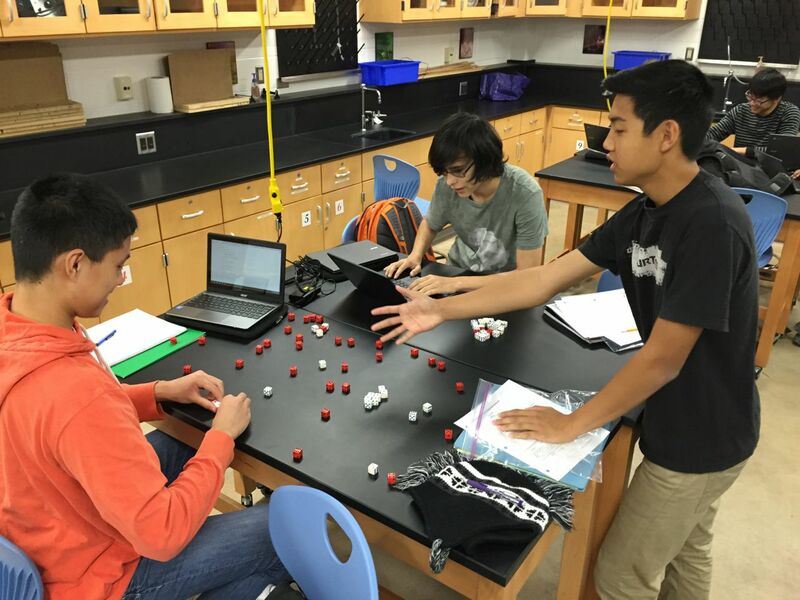 While perhaps not an huge part of the new curriculum, heat engines nicely connected everything that we’ve been studying so far in the thermodynamics unit and set the stage for our investigation of entropy next week. I also think it is fantastic for students to leave with a basic understanding of how an internal combustion engine works since very few students understand this in my class. This slow-motion video of a couple of cycles of an internal combustion engine is fantastic!